A United Launch Alliance Atlas V rocket carrying NASA's four Magnetospheric Multiscale mission satellites rolls out to the launch pad at Cape Canaveral Air Force Station in Florida one day before its planned March 12, 2015 launch. The mission will study magnetic reconnections in Earth's magnetic field to better understand solar storms. CAPE CANAVERAL, Fla. — NASA is poised to launch four satellites tonight (March 12) on a mission to study a phenomenon in Earth's magnetic field that could be key to understanding space weather events that can impact the planet, and you can watch the liftoff live online. The Magnetospheric Multiscale mission, or MMS for short, consists of four satellites that will fly in formation in Earth orbit. 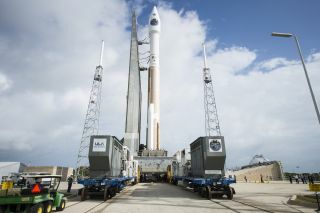 The satellites are currently packed atop a United Launch Alliance Atlas V rocket that is set to launch at 10:44 p.m. EDT (0244 GMT) tonight (March 12) from Space Launch Complex-41 at Cape Canaveral Air Force Station in Florida. NASA coverage of the launch will begin at 8 p.m. EDT (midnight GMT), and you can watch the launch live on Space.com, courtesy of NASA. NASA's four Magnetospheric Multiscale mission satellites, stacked like a cake, are seen ahead of their planned launch from Cape Canaveral Air Force Station in Florida on March 12, 2015. Here, engineers in a clean room are processing the satellites for their liftoff. A constellation of four satellites orbit through Earth's magnetic field to study the mysterious phenomenon called magnetic reconnection. See how NASA's Magnetospheric Multiscale mission works in our infographic. The launch likely will be visible from Orlando, about 50 miles west of Cape Canaveral, Clay Flinn, launch weather officer with the 45th Weather Squadron at Cape Canaveral Air Force Station, said in a news briefing on Tuesday (March 10). But, clouds might block the view of the rocket once it reaches 25,000 feet (7,600 meters) in altitude, Flinn said. This would mean the view would be obscured when the two rocket boosters separate from the rocket. The $1.1 billion MMS mission will study a phenomenon known as magnetic reconnection, the key driver of what is known as space weather, which includes ejections of energetic particles from the sun and the creation of the auroras at the north and south poles. Magnetic reconnection is a "universal" process, say MMS scientists, and occurs in many other places in the universe. You can see a video of how NASA's MMS satellites work here. MMS is the first and only space experiment dedicated solely to studying magnetic reconnection. This process occurs when magnetic field lines break and reconnect, releasing huge amounts of energy that subsequently accelerate particles to nearly the speed of light. The four MMS satellites were built and tested at NASA's Goddard Space Flight Center in Greenbelt, Maryland. Multiple institutions and universities contributed to the science and instrumentation on the MMS satellites. The program's scientists say it is not yet known how the energy from magnetic field lines is transformed into heat and kinetic energy. MMS has a resolution that will allow scientists to observe these extreme events all the way down to the level of electrons. This is a resolution 100 times higher than previous experiments that have observed this phenomenon, according to MMS scientists. This is NASA's 12th launch with an Atlas V rocket, according to Vernon Thorp, a program manager for NASA missions with United Launch Alliance. If NASA is unable to launch the MMS satellites tonight, the space agency could try again on Friday night (March 13), mission managers said. Visit Space.com today for complete coverage of NASA's Magnetospheric Multiscale mission launch.